Shareholder value is the financial worth owners of a business receive for owning shares in the company. An increase in shareholder value is created with a company earns a return on invested capitalROICROIC) (Return on Invested Capital) is a profitability or performance ratio that aims to measure the percentage return that investors in a company are earning from their invested capital. The ratio shows how efficiently a company is using the investors' funds to generate income. that is greater than its weighted average cost of capital. Put more simply, value is created for shareholders when the business performs better than they expect it to. Since the value a company and its shares are based on the net present valueNet Present Value (NPV)Net Present Value (NPV) is the value of all future cash flows (positive and negative) over the entire life of an investment discounted to the present. NPV analysis is a form of intrinsic valuation and is used extensively across finance and accounting for determining the value of a business, investment security, of all future cash flows, that value can be increased or decreased by changes in cash flow and changes in the discount rate. Since the company has little influence over discount rates, its managers focus on investing capital effectively to generate more cash flow with less risk. 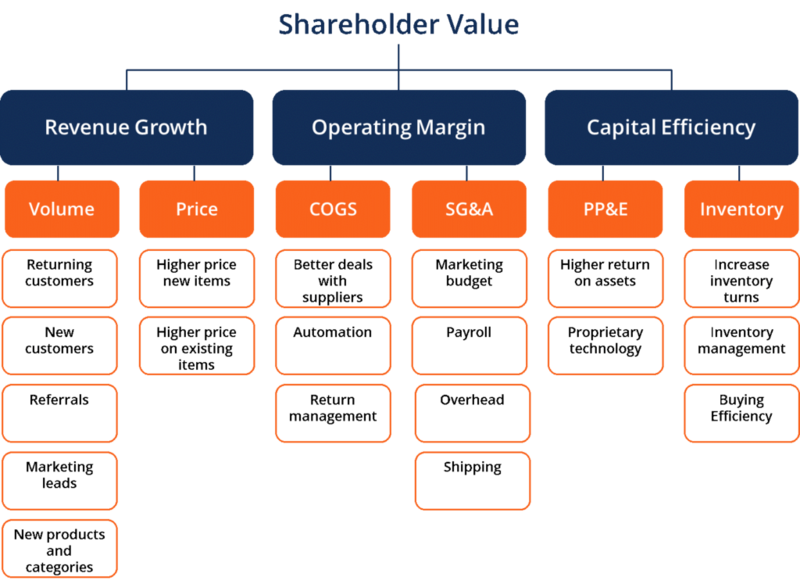 In order to maximize shareholder value, there are three main strategiesStrategyCorporate and business strategy guides. Read all CFI articles and resources on business and corporate strategy, important concepts for financial analysts to incorporate in their financial modeling and analysis. First mover advantage, Porter's 5 Forces, SWOT, competitive advantage, bargaining power of suppliers for driving profitability in a company: (1) revenue growth, (2) operating margin and (3) capital efficiency. We will discuss in the following sections the major factors in boosting each of the three measures. For any goods and services businesses, sales revenueSales RevenueSales revenue is the starting point of the income statement. Sales or revenue is the money earned from the company providing its goods or services, income can be improved through the strategies of sales volume increase or sales prices inflation. A company would want to retain its current customers and keep them away from competitors to maintain its market share. It should also attract new customers through referrals from existing customers, marketing and promotions, new products and services offerings, and new revenue streamsRevenue StreamsRevenue Streams are the money a business earns from the sale of goods or provision of services. The types of revenue that a business records on its accounts depend on the types of activities carried out by the business. Learn about the different types, how to categorize them and. A company may increase current product prices as a one-time strategy or gradual price increases throughout several months, quarters, or years to achieve revenue growth. It can also offer new products of advanced qualities and features and price them at higher ranges. Ideally, a business can combine both higher volume and higher prices to significantly increase revenue. Beside maximizing sales, a business must identify feasible approaches to cost reductions leading to optimal operating margins. While a company should strive to reduce all its expenses, COGS (Cost of Goods SoldCost of Goods Sold (COGS)Cost of Goods Sold (COGS) measures the “direct cost” incurred in the production of any goods or services. It includes material cost, direct labor cost, and direct factory overheads, and is directly proportional to revenue. As revenue increases, more resources are required to produce the goods or service. COGS is often) and SG&A (Selling, General, and Administrative) expenses are usually the largest categories that need to be efficiently managed and minimized. When a company builds a good relationship with its suppliers, it can possibly negotiate with suppliers to reduce material prices or receive discounts on large orders. It may also form a long-term agreement with the suppliers to secure its material source and pricing. Many companies use automation in their manufacturing processes to increase efficiency in production. Automation not only reduces labor and material costs, but also improves the quality and precision of the products and thus largely reduces defective and return rates. Return management is the process by which activities associated with returns and reverse logistics are managed. It is an important factor in cost reduction because a good return management process helps the company manage the product flow efficiently and identify ways to reduce undesired returns by customers. SG&ASG&ASG&A includes all non-production expenses incurred by a company in any given period. This includes expenses such as rent, advertising, marketing, accounting, litigation, travel, meals, management salaries, bonuses, and more. On occasion, it may also include depreciation expense is usually one of the largest expenses in a company, therefore being able to minimize them will help the company achieve an optimal operating margin. The company should tightly control its marketing budget when planning for next year’s spending. It should also carefully manage its payroll and overhead expenses by evaluating them periodically and cutting down unnecessary labor and other costs. Shipping cost is directly associated with product sales and returns. Therefore, good return management will help reduce the cost of goods sold as well as logistic cost. Capital efficiency is the ratio between dollar expenses incurred by a company and dollars that are spent to make a product or service, which can be referred to as ROCE (Return on Capital Employed) or the ratio between EBIT (Earnings Before Interest and Tax) over Capital Employed. Capital efficiency reflects how efficiently a company is deploying its cash in its operation. Capital employed is the total amount of capital a company uses to generate profit, which can be simplified as total assets minus current liabilities. A higher ROCE indicates a more efficient use of capital to generate shareholder value, and it should be higher than the company’s capital cost. To achieve high capital efficiency, a company would first want to achieve a high return on assets (ROAReturn on Assets & ROA FormulaReturn on assets (ROA), a form of return on investment, measures the profitability of a business in relation to its total assets. The ROA formula is used to indicate how well a company is performing by comparing the profit it's generating to the capital it's invested in assets. The higher the return, the more), which measures the company’s net incomeNet IncomeNet Income is a key line item, not only in the income statement, but in all three core financial statements. While it is arrived at through the income statement, the net profit is also used in both the balance sheet and the cash flow statement. generated by its total assets. Over time, the company might also shift to developing its proprietary technology, which is a system, application or tool owned by a company that provides a competitive advantage to the owner. The company can then profit from utilizing this asset or licensing the technology to other companies. Proprietary technology is an optimal asset to possess because it increases capital efficiency to a great extent. InventoryInventoryInventory is a current asset account found on the balance sheet consisting of all raw materials, work-in-progress, and finished goods that a company has accumulated. It is often deemed the most illiquid of all current assets, and thus it is excluded from the numerator in the quick ratio calculation. is often a major component of a company’s total asset, and the company would always want to increase its inventory turnover, which equals to net sales divided by average inventory. A higher inventory turnover ratio means that more revenues are generated given the amount of inventory. Increasing inventory turns also reduces holding costs, consisting of storage space rent, utilities, theft and other expenses. It can be achieved by effective inventory management, which involves constant monitoring and controlling of inventory orders, stocks, returns or obsolete items in the warehouse. Besides, inventory buying efficiency can be greatly improved by using the Just-in-time (JIT) system. Costs are only incurred when the inventory goes out and new orders are being placed, which allows companies to minimize costs associated with keeping and discarding excess inventory. There are so many factors that influence shareholder value it can be very difficult to accurately attribute the causes in its rise of fall. Managers of businesses constantly speak of “generating shareholder value” but it is often more of a soundbite than an actual practice. Due to a host of complications, including executive compensation incentives and principal-agent issues, the primacy of shareholder value can sometimes be called into question. Businesses are influenced by many outside forces and thus the impact of management vs external factors can be very hard to measure. Read more from Harvard about strategies for creating shareholder value. Return on Invested Capital (ROIC)Return on Invested CapitalReturn on Invested Capital - ROIC - is a profitability or performance measure of the return earned by those who provide capital, namely the firm’s bondholders and stockholders. 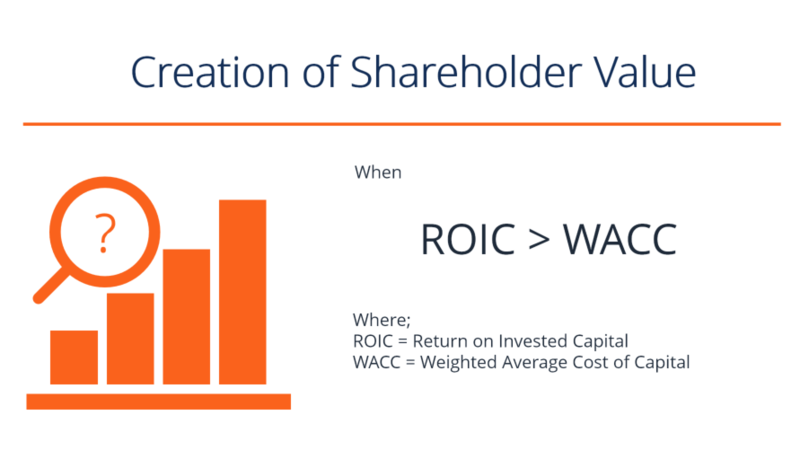 A company's ROIC is often compared to its WACC to determine whether the company is creating or destroying value.